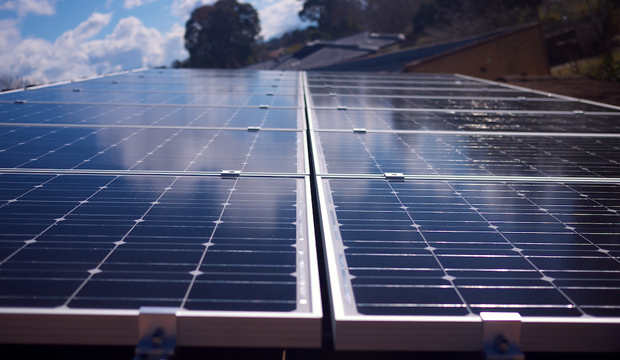 Homeowners across the United States have begun a rooftop solar revolution. Since 2000, more than 1,460 megawatts of residential solar installations have been installed across the country, and more than 80 percent of that capacity was added in the past four years. In 2012 alone, rooftop solar installations reached 488 megawatts, a 62 percent increase over 2011 installations and nearly double the installed capacity added in 2010. Residential solar photovoltaic, or PV, systems—also referred to as “distributed” or “rooftop solar” in this report—consist of an array of solar panels that are roof or ground mounted to produce electricity that is either fed back into the electric grid—grid connected—or solely used onsite by the residential building—off grid. The question is: Who is buying up all of those solar power systems? Through our analysis of solar installation data from Arizona, California, and New Jersey, we found that these installations are overwhelmingly occurring in middle-class neighborhoods that have median incomes ranging from $40,000 to $90,000. The areas that experienced the most growth from 2011 to 2012 had median incomes ranging from $40,000 to $50,000 in both Arizona and California and $30,000 to $40,000 in New Jersey. Additionally, the distribution of solar installations in these states aligns closely with the population distribution across income levels. But many within the electric utility industry have claimed that distributed solar is mainly being adopted by wealthy customers. Concerned by the threat that rooftop solar’s rapid growth poses to traditional utility business models, some utility executives have used this claim to support a rising desire within the industry to alter existing solar programs and policies. The idea is that through solar policies such as net metering, middle- and low-income customers who cannot afford to go solar are subsidizing the wealthy customers who can. In this issue brief, we show that rooftop solar is not just being adopted by the wealthy; it is, in fact, mostly being deployed in neighborhoods where median income ranges from $40,000 to $90,000. In the first section, we present the overall findings from our income analysis of solar installation data from Arizona, California, and New Jersey. We then discuss the implications of those results in the context of the current growth of rooftop solar and the ongoing discussion of solar policies that will affect its future growth. California, Arizona, and New Jersey are currently leading the nation in solar deployment and therefore offer insights into the way that rooftop solar is being adopted across the country. Although these states are home to varying solar programs and incentives, similarities exist in the way that residential solar installations occur across income levels, with our research showing that the majority of solar power systems are being installed in middle-class neighborhoods. We collected solar installation data contained in the Arizona Public Service, or APS; the California Solar Initiative, or CSI; and New Jersey’s Clean Energy Program, or NJCEP, databases to examine the adoption of rooftop solar by income level. These databases contain information on individual installations for which residential and nonresidential customers have applied for solar incentives, such as rebates or renewable energy certificates. The APS database contains data on installations made under the solar rebate program offered by Arizona Public Service, which is the largest utility in Arizona and provides electric service to most of the state. The CSI database tracks installations made under the California Solar Initiative program, which offers rebates to customers of three investor-owned utilities: Pacific Gas and Electric, Southern California Edison, and San Diego Gas & Electric. The NJCEP database contains data on installations made under any of the following incentive programs offered in New Jersey: Solar Renewable Energy Certificates, the Renewable Energy Incentive Program, and the Customer On-site Renewable Energy Program. By analyzing the median household income that corresponds with installations from each ZIP code in the three datasets, we found three key similarities. First, they all exhibit a similar installation distribution pattern, in that at least 60 percent of homeowners are installing solar panels in ZIP codes with median incomes ranging from $40,000 to $90,000. In fact, 80 percent of APS installations were for customers in that income range. To demonstrate this, Figure 1 shows the percentage of rooftop solar installations by dataset and income range. Another characteristic the datasets share is that the distributions of solar installations across income levels are similar to the population distributions within each region. Figure 2 displays the installation and population distributions across income levels for each dataset. As you can see in Figure 2, the APS and CSI graphs show that installations and populations are more closely aligned in the lower income brackets of less than $60,000, while the NJCEP graph shows nearly perfect alignment in the higher income brackets of $90,000 and above. This alignment between solar installations and household distribution indicates that installations are being spread somewhat evenly over the population, especially in the lower income ranges in Arizona and California and in the higher income ranges in New Jersey. Out of all of the datasets, the distribution of CSI installations is the most skewed toward the upper income brackets. The third similarity between the datasets is the growth of solar installations occurring in neighborhoods with median incomes ranging from $40,000 to $90,000 over the past several years. Figure 3 shows the share of installations by income range for each dataset from 2009 to the present. All three graphs in Figure 3 show a positive growth trend for the $40,000 to $90,000 income range, and so far, 2013 has continued that trend. Notably, the share of installations occurring in ZIP codes with median incomes of less than $40,000 increased in both the CSI and NJCEP datasets from 2011 to 2012. Our analysis also provided other interesting results in the areas that have seen the highest number of cumulative installations and the fastest year-over-year growth from 2011 to 2012. In Arizona, the highest number of installations occurred in ZIP codes with median incomes ranging from $40,000 to $50,000. In California and New Jersey, homeowners who live in ZIP codes with median incomes ranging from $70,000 to $80,000 have installed the most solar power systems. The areas that experienced the most growth from 2011 to 2012 had median incomes ranging from $40,000 to $50,000 in both Arizona and California and $30,000 to $40,000 in New Jersey. Although rooftop solar currently makes up less than one-quarter of 1 percent of the electricity produced in the United States, utilities are beginning to see how solar could eventually affect their business models as it is rapidly adopted in their service territories. As homeowners install solar panels on their roofs, they reduce the amount of electricity they have to buy from their utility. Utilities, which generally include a portion of fixed costs in their energy-use charges, will then need to raise their electricity rates in order to maintain the electric grid and infrastructure, leading to what is known as the “utility death spiral.” As rates increase, more utility customers will choose to go solar, and rates will continue to go up. The death-spiral threat has caused many in the utility industry to examine their solar-related policies, and some utilities are now attempting to revise solar incentives and rate structures such as net metering. Net metering, which allows solar customers to get credit for any excess energy they supply to the electric grid, is one of the most contentious topics right now in the utility industry; solar advocates are following it closely because of its importance to the growth of rooftop solar. But solar technology, which has become more accessible in the past few years due to falling costs, as well as incentives and solar programs, is now being installed across different income levels, and it is especially popular among homeowners who live in ZIP codes with median incomes ranging from $40,000 to $90,000. While it is true that the wealthy are generally the first adopters of new technologies, our research suggests that solar technology has moved beyond the early adopter phenomenon and onto more widespread installation by the middle class. The oft-repeated utility-industry narrative is not only being used as a vehicle for solar policy scrutiny—it also serves as a distraction from the fact that solar technology provides the same benefits to the grid regardless of the homeowner’s income level. These benefits include avoided fuel costs, reduced transmission and distribution costs, emissions-free energy production, and generation capacity that can offset use during peak energy-consumption times during the day in certain regions. Some utilities have quantified those benefits and found that the value that solar technology brings to the grid in their service territory is actually higher than the retail electricity rate. Through a value-of-solar rate structure, for example, Austin, Texas-based municipal utility Austin Energy pays its solar customers 12.8 cents for every kilowatt hour their systems generate, which is higher than the current retail rates, which range from 3.3 cents to 11.4 cents per kilowatt hour—depending on each customer’s overall energy use—and are based on a value-of-solar study done by Clean Power Research that is updated annually. Net metering and other solar policies encourage rooftop solar deployment and have made solar power generation a good deal for more than just the wealthy. It is important that these policies continue to be offered to accelerate the growth of rooftop solar in neighborhoods across the country. The transition to a cleaner, lower-carbon electricity system is critical to our ability to meaningfully address climate change now and in the coming years. This transition will require the deployment of vast amounts of solar power systems, and the opportunity to put those systems on homes in every city is too great to pass up. As net metering and other solar policies are debated in different parts of the country, regulators and policymakers should consider the impacts that any changes will have on the affordability of solar technology for middle-class homeowners and how they will impact the future growth of rooftop solar. Middle-class homeowners are leading the rooftop solar revolution. This finding will have far-reaching implications as utilities across the country consider revising their solar programs and rate structures, which benefit lower- and middle-class people—who are increasingly installing solar—and not just wealthier people. Our research shows that most solar installations are occurring in middle-class neighborhoods, and that the fastest-growing areas for rooftop solar have median incomes ranging from $40,000 to $50,000 in Arizona and California and from $30,000 to $40,000 in New Jersey. Regulators and policymakers should consider how net metering and other solar policies support the growth of rooftop solar among middle-class homeowners and how they can continue to expand the use of a clean, renewable energy resource. 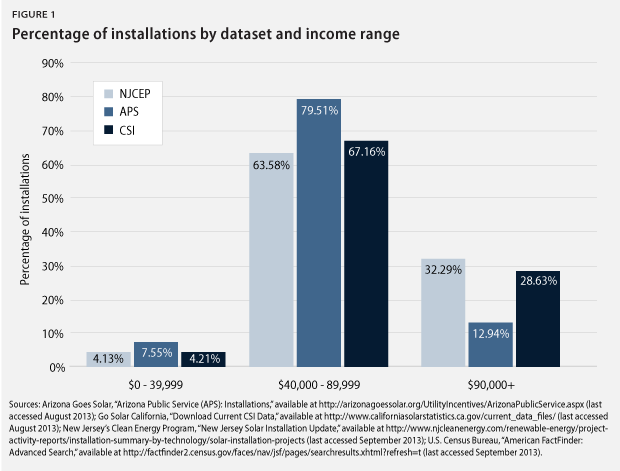 To determine the income distribution of rooftop solar customers, we collected data from the APS, CSI, and NJCEP databases. APS is the largest electric utility in Arizona. It provides electric service to almost all of the state, excluding half of the Phoenix metropolitan area, the Tucson metropolitan area, and Mohave County in Northwestern Arizona. The APS database contains solar installation data for residential and nonresidential customers who applied for solar incentives within the APS territory from January 2002 to the present. The APS data were downloaded on August 8, 2013, and filtered for completed residential solar photovoltaics, or PV, system installations. CSI is the solar rebate program offered to customers of three investor-owned utilities: Pacific Gas and Electric, Southern California Edison, and San Diego Gas & Electric. The CSI database contains solar installation data for residential and nonresidential customers who have applied for rebates under the CSI program from January 2007 to the present. The CSI data were filtered for completed residential solar PV system installations. Our analysis was based on the August 7, 2013, version of the CSI database. NJCEP promotes energy efficiency and the use of renewable energy sources in New Jersey. The NJCEP database contains solar installation data for residential and nonresidential customers who have registered for Solar Renewable Energy Certificates or received solar rebates through the Renewable Energy Incentive Program—which closed to new solar rebate applications in 2010—and the Customer On-site Renewable Energy Program, which closed to new applicants in 2008. The NJCEP data were downloaded on September 5, 2013, and filtered for completed residential solar PV system installations. Using information from the U.S. Census Bureau’s 2011 American Community Survey, which gauged five-year estimates, we found the median household income for each ZIP code in which there was a residential solar installation accounted for in the APS, CSI, and NJCEP databases. We analyzed 17,162 installations and 187 ZIP codes in Arizona, 80,440 installations and 1,275 ZIP codes in California, and 17,987 installations and 562 ZIP codes in New Jersey. We analyzed median income data at the ZIP-code level from the U.S. Census Bureau because actual income data for each installation are not publicly available. There is an inherent amount of uncertainty in using median income data as proxies for real income data, as actual incomes associated with each installation could be higher or lower than the median income. It should also be noted that the number of installations in the three datasets analyzed in this study does not reflect all residential solar installations within each state. As of the end of 2012, the NJCEP dataset we analyzed captured 98 percent of cumulative installed residential capacity in megawatts in New Jersey, the APS dataset covered 64 percent of cumulative installed residential capacity in Arizona, and the CSI dataset accounted for 55 percent of cumulative installed residential capacity in California. Additionally, the CSI program rebates have been declining as installed capacity reaches specific milestones. Initial rebates began at $2.50 per watt in 2007, and because the program has been so successful, the rebates are now just $0.20 per watt, as each utility participating in the program has nearly met its final capacity goals. Because of these lower rebate payments, it is likely that fewer new customers are accounted for in the CSI database, which could be especially true for wealthier customers, who may have decided to forgo the CSI application process. Therefore, some of the increase in the share of installations that have occurred in areas with lower median incomes over the past couple years could be due to the lower rebate payments.